Directions: Twist open the cap and squeeze container to puff Dry Shampoo onto your brush or directly into the hair. Work into the scalp and comb through to the ends. Easy breezy! I have black hair and it gets oily so quickly. I used to wash my hair every other day. Now I wash it every 3-4 days. I rub the powder into my roots and it works like a charm. As an added bonus, this dry shampoo gives me a bit more volume as it adds texture to my hair. I would say a bottle lasts me about 6-8 months. You donâ€™t need a lot. I have black hair and I really like that this dry shampoo did not leave my hair looking ashy. The fragrance is light and pleasant, not too strong. I also like that itâ€™s a shaker bottle rather than spray. I bought this so I can skip washing my hair on workout days and Iâ€™m a mom who seriously misses the luxury of extra time. The only reason Iâ€™m giving it 4 stars and not 5 is because the price is a bit too high. Product is ok. 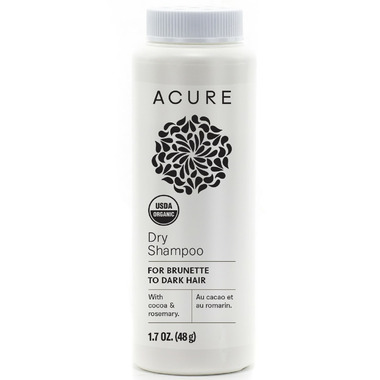 I like that it doesnâ€™t turn my brunette hair white like a lot of other dry shampoos. Not a fan of how my hair feels the next day after using it. Not sure if Iâ€™ll purchase again. Just ok. Price too high for the quatity. Really love that I don't have to shampoo as often after using this product. It is like putting baby powder on your hair but with practice, found that using less is better...just rub it in more & hair won't get too light either. Gave this a 4/5 only because of it's price for such a small bottle. It does seem to be lasting quite long however. Is also the only natural good dry shampoo out there that I know of. I don't know...thought this would be like other dry shampoo where it comes out in mousse form. This feels like rubbing baby powder into your hair. It doesn't blend like the other reviewers say, especially with brunette hair! I have extremely oily hair to the point I feel I have to shower twice a day. As someone who showers daily I was able to let my hair go unwashed for a couple days which is fantastic! My boyfriend also started using it and now demands his own . I have tried a few dry shampoos but they all turned my dark hair white, and didn't work amazing. This stuff doesn't show any whiteness (unless I really really over do it), and it works better than any product I've used before for getting rid of greasy hair. For the first time I am able to work-out before work and just use this on my hair instead of fully washing it in the shower.